I can never seem to pass up on good food & good wine at an affordable prices. Introducing Millesime’s Wednesday & Friday Wine Lunch Menu. And, so long as you drink the wine with the food and not before lunch, I don’t believe a single glass of any wine will leave anyone too tipsy to work. But how a wine affects you may also be a matter of stamina, body type and habit. I for one, have great stamina when it comes to wines. If you want to be certain that you will be in fine form after lunch, then just stick with one wine.. or don’t drink more than two glasses. 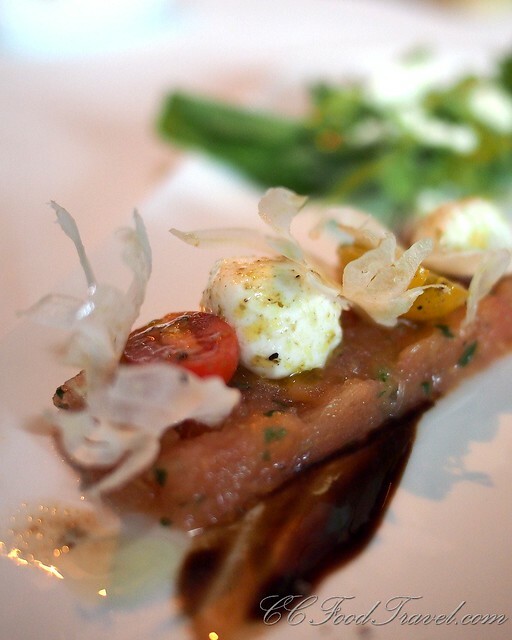 Either way, the food at Millesime is so good, you will marvel at how well paired the food-wine combination is. Yes, that’s right folks.. wine pairing with fine food at a net price of RM120 (Wednesdays) or RM150 (Fridays), only at Millesime. 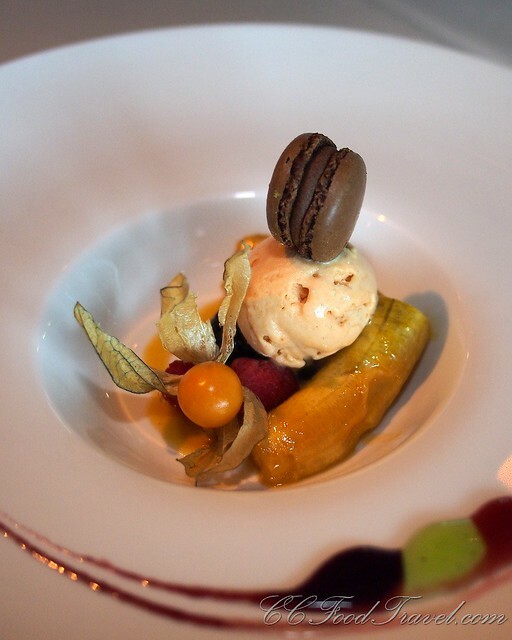 This crowd-pleasing promotion should be especially attractive to executive patrons (bosses and managers who do not have anyone to answer to, nor run the risk of having their breaths vetted for alcoholic fumes) and of course the impeccable menu enables you to wow the clients that you in turn are hosting, and make a good, lasting impression. 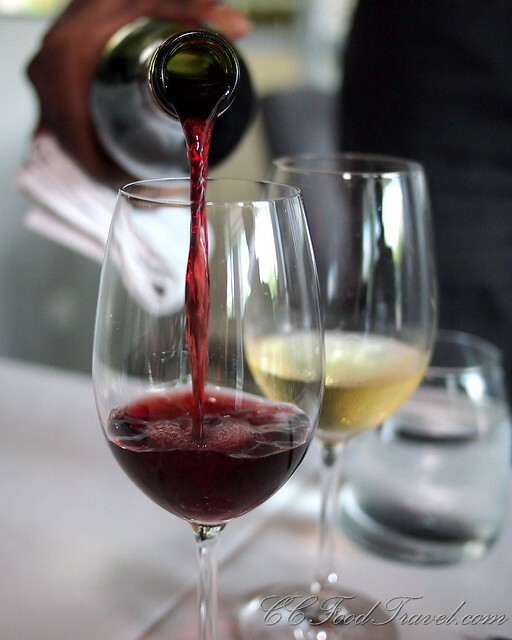 The Friday Wine Lunch Menu features the same concept as the Wednesday Wine Lunch but is different in that 5 courses are served instead of 3, and it is priced at RM150, instead of RM120. Here is what we had for our Friday Wine Lunch at Millesime.. 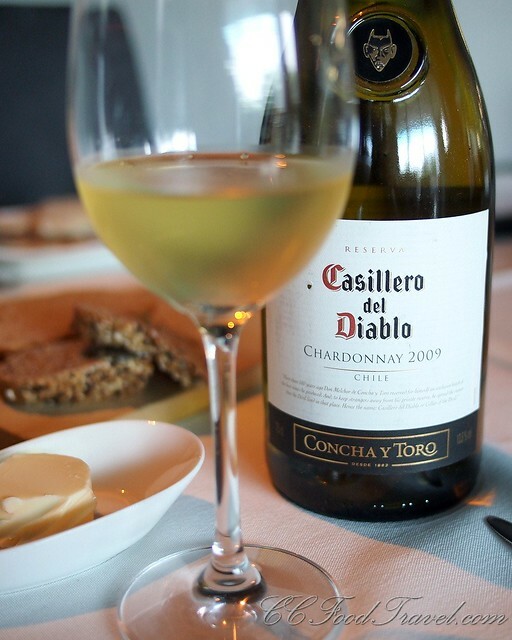 The Casillero del Diablo Chardonnay was a great pair for the mozzarella, tomato and pesto starter. Packed with tropical-fruit flavours and subtle hints of vanilla, this crisp Chardonnay made by one of Chile’s best winemakers goes terrific with seafood or creamy pasta dishes as well. 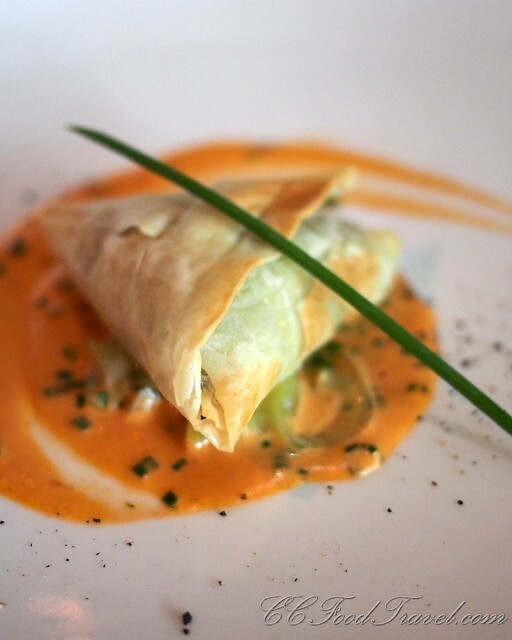 Duck Breast, Mushroom – Leek Phillo Pastry that was paired with the Brancott Pinot Noir. A gamy duck that paired well with this medium bodied red. 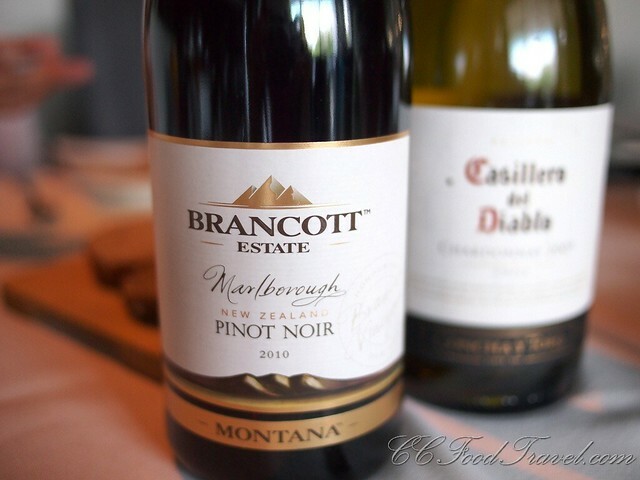 With aromas of ripe cherry and plum, accentuated with spice and savory highlights, the style of this wine is typical of fruit-driven Pinot Noir originating from our premium Marlborough vineyards. It has rich, velvety tannins and a long, concentrated finish – balancing structure with concentration. This goes great with most red meats with a gamier feel as it cuts through the strong meaty flavours. Again this third course of Duck Breast, Mushroom, Leek Phillo Pastry was too salty for me. Luckily the red wine helped to alleviate the saltiness a tad. 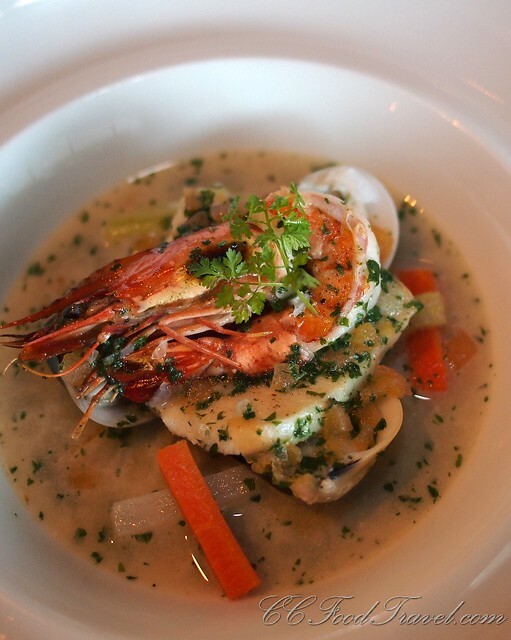 Shellfish Nage, Poached Cod Fish and Provencale Vegetables paired with the Casillero del Diablo Chardonnay. Of the dishes served that afternoon, this Seafood dish was outstanding! Flavourful, without being too overpowering, it has the lightest seafood stock one can imagine. Fresh seafood that was succulent and that paired well with the chardonnay, made a real impression on us that day. 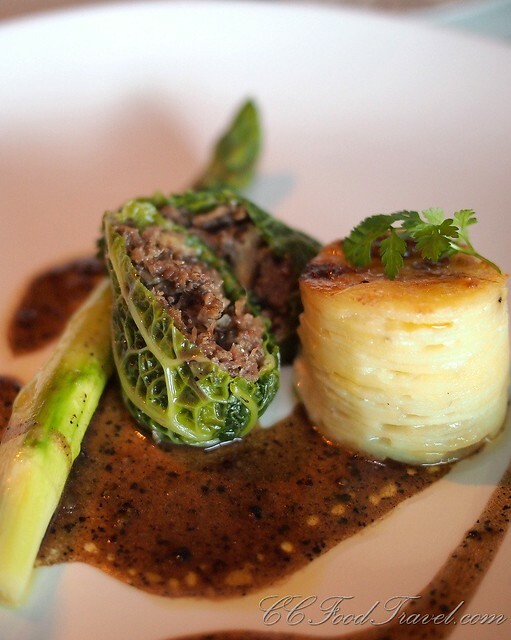 The Oxtail Confit, Black Pepper Sabayon and Potato Terrine paired with the red Brancott Pinot Noir is a good choice for people who don’t fancy seafood our are in the mood for some red meat. This oxtail was fall off the bone tender and had a nice cartilaginous texture to it. 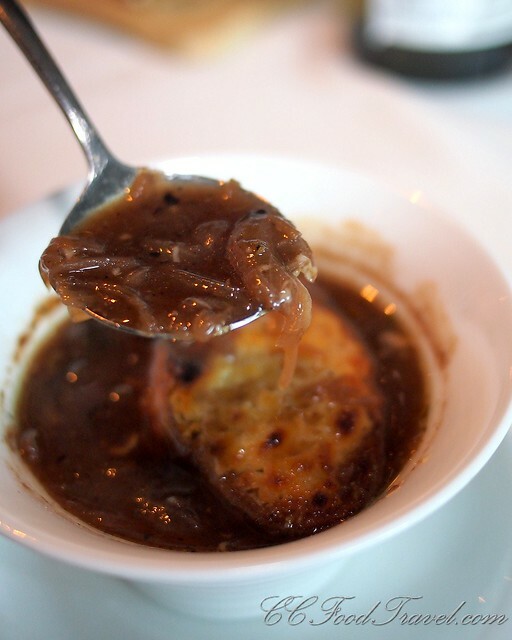 The savoy cabbage used to envelope the oxtail was a nice touch – imparting a crunchy texture to each bite as well. Also a winner in our books, but could have been a little less salty. With dessert and some freshly Brewed Coffee or Flavored Tea to sober up from the great wine pairing fine food lunch, we conclude that Millesime does indeed know how to throw a fine wine lunch. We will be back with clients in tow.. but only those whom we want to impress of course. Ah yes indeed… “Work, will be done”. LOL, Well, don’t have too many glasses then. Food was awesome! everything looks good. is Max back yet? Must take leave to go eat there on weekdays… work will NOT be done, otherwise! LOL!